The Staff College: Leadership in Healthcare (Staff College) is an independent charity dedicated to developing healthcare leaders and helping them to deliver better outcomes. Our experienced and well-regarded faculty brings together senior healthcare leaders with both clinical and non-clinical backgrounds, military leaders with extensive experience of developing others and leadership development experts and executive coaches from the business and education sectors. Together they have a rich collective wisdom on leadership and develop our potent brand of leadership development. At Staff College, everything we do is about people, from those that are involved in the charity, to the leaders we work with across the system. We’re incredibly lucky to have the support of so many talented leaders across the public sector, many of whom give their time to us for free because they believe passionately in our cause. You can find out more below about all those that contribute to the charity’s success. The NHS is arguably one of the most complex group of organisations in the world, tasked with one of the most important roles, the provision of care for people. And yet, as the delivery of care becomes ever more complex, adapting to the increasing pressures of a growing population and resource constraints, the formal development for those in positions of leadership remain fairly limited. While huge progress has been made in the years since Staff College started, there remain huge gaps in the opportunity for individuals working within the NHS and beyond to access formal development with the pressures of funding constraints and with it harder now to take time away from the front-line. As such, we believe that when individuals are able to access development, we think it needs to have the greatest impact on them possible, challenging individual leaders to have the moral courage to step up in the difficult moments, helping them develop their resilience to see them through those moments, and supporting them to understand how their behaviour as an individual impacts on those around them and helping them understand, through honest and constructive feedback, how to better manage this for the benefit of their teams. You can find out more about why we started, our vision and mission, or about our approach to developing potent and impactful programmes. 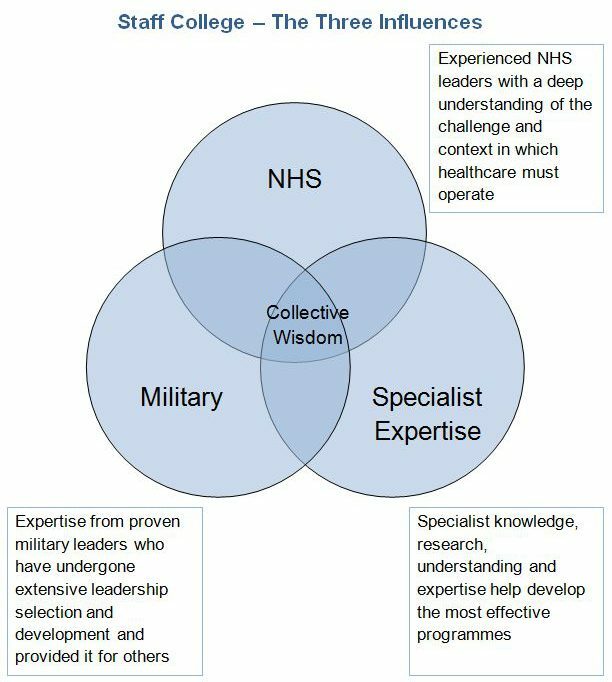 We design and deliver behavioural based programmes, drawing on the unique leadership learning of the military and underpinned with a profound humility which recognises that if we can’t lead ourselves, the care of our patients isn’t what it could and should be. We provide a challenging, demanding, safe and fun environment in which individual’s insights are developed, personal capabilities are enhanced and leadership potential and skills optimised. We deliver a wide range of leadership development programmes for individuals, teams, Boards, and organisations within primary and secondary care as well as supporting Sustainability and Transformation Partnerships, Integrated Care Systems and multi-organisation transformation Boards using our unique approach to leadership development. We work with leaders at all stages within their career within the NHS and wider healthcare service. We refer to those who attend our programmes as ‘Members’ as we believe leadership development is a continuous process. Many of our ‘Members’ attend programmes with us at an early stage in their career, and come back to attend more challenging programmes as they reach more senior positions. Since we started in 2010, over 2600 members have attended our leadership development programmes. Our members come from a diverse range of specialties. Over 170 directors, 420 consultants, 110 GPs, 230 senior nurses and midwives, and 320 senior managers have attended, with many more from across the health care community and the Military. Our members come from over 100 organisations including 65 hospital trusts, 15 CCGs, 3 STPs, 7 universities, NHS England, Public Health England, NHS Improvement, the Department of Health, Royal Colleges, 12 charities, 5 private care companies and the Military…among others! We develop programmes for a variety of organisations involved in delivering care, NHS Trusts, Clinical Commissioning Groups, Academic Health Science Networks, Universities, and National Organisations such as NHS England, NHS Improvement and Public Health England. As an independent charity, we are able to support the development of individuals from across the whole health and care community. We are not tied to only being able to deliver programmes to particular staff groups, or specific organisations or geographies. We are also free to collaborate with different partners, providing us with the flexibility to deliver a wide range of programmes, where they’re needed most. As a non-profit making organisation we can keep the costs of our programmes to a minimum. We are able to attract charitable funding in order to offer subsidised places to those who most need financial support. We are committed to developing leaders, not just as individual leaders who will make a difference to their organisations, but also to developing new faculty members who are embedded in their organisations and communities. These faculty members can, in turn, support our mission by delivering our programmes to more leaders across the system, but can also use their new skills to further support leadership development within their own organisations or networks. This will allow organisations that we are engaged with to become more self-sufficient in terms of their own future capability to develop their own people. We believe that this will allow us to have a much greater impact across the system, and in turn reduce the spending of individual organisations on their leadership development in time, as we will be supporting their ability to develop their own individuals in house. Our Faculty are the heart of Staff College. Composed of senior leaders from health, the military, business and education, they deliver our programmes to the highest standards and create the environments and experiences that our Members find so powerful. Our Board of Trustees are responsible for the charity. Senior clinical Trustees ensure we remain rooted within the NHS and continue to understand the evolving and complex challenges felt within it, while specialists from a range of backgrounds ensure there is appropriate oversight and assurance. Our Advisory Council brings together people with many years of experience at the highest level in the NHS and social care, practising clinicians, senior NHS managers as well as senior military representatives, and experts from across business and education. Members contribute to Staff College in an advisory role with this unique mixture of skills, knowledge and experience combining to help us shape Staff College leadership modules and programmes that address the real challenges facing health service leaders today. In 2013 we launched the first of our annual lectures, delivered by Sir Robert Francis QC following his recent report into Mid Staffs. Since then, we’ve been honoured to have a wide range of inspirational leaders joining us as Honorary Fellows, and delivering one of our annual lectures.